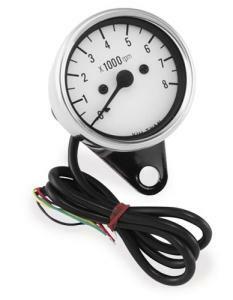 Here's a 2.5" diameter tachometer that does one thing really well: it displays your engine's revolutions per minute (RPMs). Is anyone surprised by this? Probably not. But this particular Biker's Choice model is a universal mount, chrome-plated electric tachometer (not mechanically driven) and has a clean and easy-to-read analog white face-that is to say, as long as it isn't dark. This model is not lighted. An electric tachometer is defined, in engineering terms, as a "device used to gauge an engine's rotational velocity by measuring a generator's output voltage." Tachometers are handy when tuning engines; for knowing when to shift, especially as relates to racing; and sometimes you don't need a reason, they just look good on your bike. And you'll probably notice yourself becoming accustomed to knowing where your tach sits at various speeds, especially on long trips. Installation is fairly quick and easy. Basically, mount the instrument where it's of the most use/aesthetically pleasing to you, and attach the wires where the directions tell you. The price is very much in line with competitors.